The properly musical content of music is plied by becomings-woman, becomings-child, becomings animal; however, it tends, under all sorts of influences, having to do also with the instruments, to become progressively more molecular in a kind of cosmic lapping through which the inaudible makes itself heard and the imperceptible appears as such; no longer the songbird, but the sound molecule. 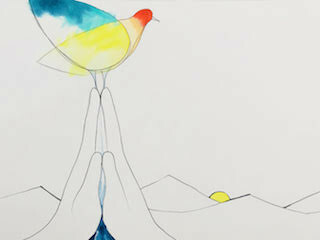 The songbird becomes the sound molecule and retains its songbird life in the process. Looked at in this way, we see an illustration visually and beautifully demonstrating this aesthetic with the front cover of the new album by MaMuse: prayers for freedom. The sound molecules expressed in their new music react and combine in alchemically significant ways. The human design has three basic components or "bodies," sometimes called neurocircuits: the physical, the emotional and the mental. I am greatly oversimplifying to make a point. The physical body grows, develops and gets nurtured through food, water and sunlight. The mental body grows by learning things, taking in information and ideas etc. Art, in particular music, nurtures, develops and grows the emotional body. Just like the physical body and the mind, the heart grows with good input, exercise and use. To encourage that organ to grow and become stronger, to become mighty in its application, if music is what moves you, then I highly recommend a sustained cycle of prayers for freedom on an endless loop. To repeat: The sound molecules expressed in this music react and combine in alchemically significant ways. MaMuse is a folk/gospel duo consisting of Karisha Longaker and Sarah Nutting. Their sound on this new offering is fleshed out by new and old friends that include Mike Wofchuck on drums and percussion, Walter Strauss on guitar and production, and The Thrive Choir. Prayers for freedom is their best album yet. I was honored to record a lot of it. The best description of the nature of these sound molecules is in their own words from the MaMuse bandcamp site. Also quite relevant to the music is their dedications and consecrations given in the cd liner notes. The Muses have been generous with us in this particular set of songs for this album. We have been inspired to pull through powerful anthems for freedom and justice, soul filled serenades of generosity and kindness, playful explorations of presence and wonder, heartfelt melodies of grief and tenderness, and my goodness!!! …. Rushing Rivers FULL of songs For the Love of Water! and illuminate the embodied beauty way. may LOVE be the swords we yeild. a simple and powerful offering. in harmony with the reparations that are needed to connect us all as KIN. TRUST, INSPIRATION, PLAYFULNESS, RESPECT, SINCERITY, and LOVE. Know that I am here with you. and I will see you through to the other side. Within the chalice of your coiled cohort! Enjoy these crystal-like molecules of sound and join in with these prayers for freedom. Ain't got time to make no apology. The Wake World is a qabalistic allegory disguised as a children's fairy tale that Aleister Crowley wrote for his daughter Lola Zaza. The origin of the phrase Konx Om Pax remains unknown. It was said to have been given to candidates who had reached the degree of seer in the Eleusinian Mysteries of Ancient Greece upon their departure back into the world. MacGregor Mathers, founder of the Golden Dawn, traces it to ancient Egypt with the meaning: Light in Extension. 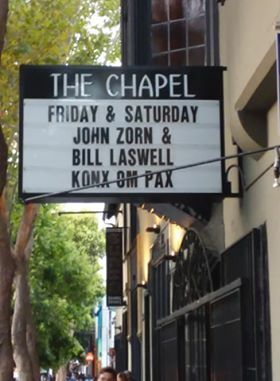 A few thousand years later, Konx Om Pax took on a musical expression with two performances by John Zorn and Bill Laswell at the Chapel in San Francisco's Mission district this past Friday and Saturday. Their music made audible forces manifesting the science and technology of the Eleusinian Mysteries, the Golden Dawn, and Aleister Crowley's system of theurgic magick to give a few names to this multiplicity. Zorn and Laswell's saxophone/bass duo tied in directly to this ancient lineage. Some say this lineage derives from Sumer, the oldest civilization known to recorded history. The Zorn/Laswell musical alliance resumes a dialog that began decades ago and will continue into the forseeable future seemingly touching upon everything under the Sun at one time or another over the years past and future. The shapeshifting moods evoked by the music the night I was there, ranged from a carefree stroll through a pastoral countryside to the apocalyptic blast of an atom bomb explosion. The musicians appear a stark contrast contrast both visually and sonically joining forces onstage to form a disjunctive synthesis. A disjunctive synthesis is a “relation of non-relation”. In Deleuze’s technical vocabulary, a disjunctive synthesis is a synthesis of divergent series that do not converge yet somehow manage to communicate by virtue of a difference that passes between them like a spark. Deleuze enters the equation because, as I have written in several previous posts, he provides the metaphysics for Crowley's Thelema. Deleuze also applied Paul Klee's famous quote, "Art does not reproduce the visible; rather, it makes visible," to music writing that music makes audible forces normally not heard. The forces driving Konx Om Pax were given a vehicle to manifest at the concert Friday night. 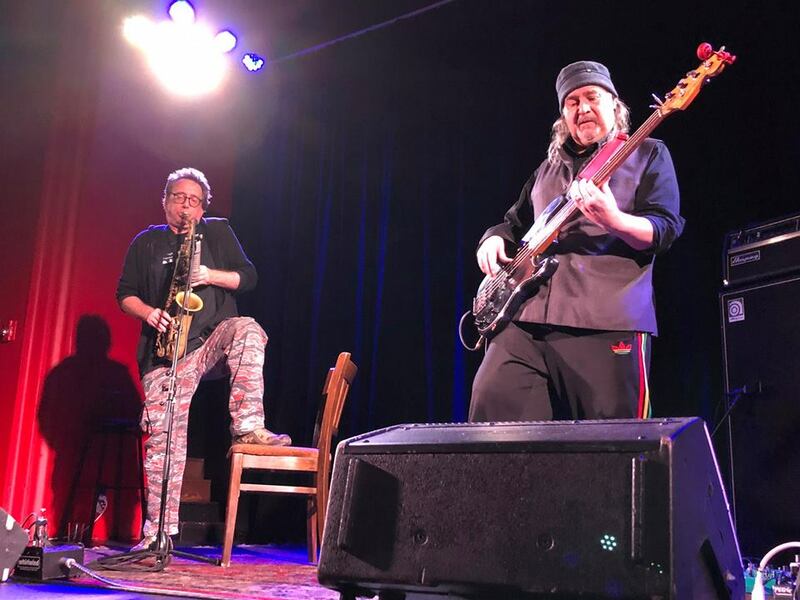 On the right side of the stage from the audience perspective, Bill Laswell plugs his fretless Fender Precision bass into an array of foot pedals that connect to a classic Ampeg SVT amplifier wired to 8 x 10 and 1 x 15 speaker cabinets. The pedals twist, turn, contort, distort, harmonize, metathasize and synthesize the timbre of the soundwaves creating a new landscape, a new space, a new dimension every time a footswitch is engaged or turned off. A pallette of sonic worlds to choose from. The left side of the stage is completely bare of equipment except for a mic stand holding an Electrovoice RE 20 microphone and a chair never used except as a foot rest. The sole sound generator here is John Zorn and his well-traveled alto saxophone. Despite the lack of electronics he achieves a great deal of variability with his sound through mic positioning and how he uses the instrument, in particular, the mouthpiece. For example, a muted sound comes from holding the bell of the sax into his leg. At times it seems like the sax phrases become the thread that guides the listener through the sometimes massive, sometimes delicate, labyrinth of landscapes expressed by the bass guitar and electronics. But like anything having to do with Qabalah, the roles can and do get reversed with the bass melodically threading its way through a labyrinth of saxophone landscapes. At one point I heard Bill quote the theme from Ornette Coleman's Dancing In Your Head which references a whole line of music. For me, it conjures the Master Musicians of Jajouka because there is a track of Ornette playing with them on that album. Coincidentally, I was wearing a Material/Master Muscians of Jajouka shirt. This musical quote introduces what Gurdjieff called a shock - energy coming in from a different octave, a different series of becoming. Zorn does these repetitive phrases of short scale runs that demonstrate what Deleuze means by difference and repetition: every cycle repeats the phrase yet it's slightly different each time. He may sustain the last note slightly longer, the attack may be different, different degrees of intensity etc. These differences in the repetitions allow something, a force of some kind to grow and develop; the process of creation. The listener who has the attention and focus to hear these differences will find themselves drawn deeper into the music and taken further. It seemed that the audience had this intensity of focus the night I was there. That was Friday night. I was in the neighborhood so dropped in and offered to help with the sound reinforcement. The Front of House mix engineer operates the sound system to bring sound in extension, extending it from the stage to the entire house. Despite having two of their sub woofers down, the Chapel had a powerful and clean public address system that covered the entire venue well reaching all the way up into the back corners of the balcony. There are other ways to extend the music. This is what the science and technology of the opening quotes refer to. Having the ability of uniting the microcosm with the macrocosm (or at least having the wherewithal to try) the instigator of theurgic magick can extend the atmosphere of the space much further than the immediate environment the music plays in. The uniting of the microcosm, in this case Konx Om Pax playing at The Chapel with the macrocosm of the World, starting with San Francisco and expanding out, is one function of what Thelemites call The Knowledge and Conversation of the Holy Guardian Angel. This is an operation that originates in Tiphareth. To some degree, every human sensitive to the music resonates in this way. By the Hermetic formula, "As below, so above," every human becomes a microcosm of the Universe. Anyone who tunes in to the music to such an extent that they temporarily lose most or all vestiges of personal identity carries and extends the music into new domains. The effects of the music also extended into the financial domain. Some of the proceeds from these concerts were donated to the immigrant family reunification crisis. Konx Om Pax. So that all life, animal and vegetable, seems in its essence like an effort to accumulate energy and then to let it flow into flexible channels, changeable in shape, at the end of which it will accomplish infinitely varied kinds of work. - Henri Bergson, Creative Evolution. The interior of the Chapel, the walls and ceiling, was entirely a solid bright red. Having the arched roof of a former place of worship, it reminded me of a gothic kind of Hell. The backdrop was a solid blue curtain and the lights illuminating the stage were mostly blue which visually cooled down the red hall. There were no logos, grafitti or words of any kind in sight. No words were spoken by Zorn or Laswell. Kill the word. The night was free from standard semantic symbolism allowing the communication of a whole different language, a language expressed in music. The above quote from Dante that Crowley uses in Konx Om Pax is from the 6th Canto of Inferno when Dante and Virgil enter the 3rd circle of Hell. Inferno is a guided tour of Hell. Hell, according to Crowley, is what qabalists call the space/time physical universe which sets up a paradox because it can also get perceived as the Garden. Why is God in Hell? The music Zorn and Laswell invoked became a Guide through the Land of the Dead, for those lucky enough to die to their personal story for the duration of the show.. They took us on a journey, one that was very dynamic, it went to different places at varying speeds and intensities, but never completely stopped until the end. They played about 56 minutes straight through. I heard someone mention circular breathing which also recalled The Master Musicians of Jajouka for me as they also go on for long stretches of time thanks to circular breathing. The music this night was not composed or planned in advance. It appeared as it happened in the moment through intention and necessity entering perceptible existence through a pure gesture of artistic expression. Continuing to look at the crossover of fictional, or virtual, events in a book, in this case Pale Fire by Vladimer Nabokov, and the actual events in a person's life, in this case your humble narrator. Toward the end of the reading group cycle we discovered that the murder of Nabokov's father, Vladimer Vladimirovich Nabokov was a major inspiration for Pale Fire. John Shade was murdered by someone who, for most of the book, resembles a Russian political extremist . Nabokov's father was murdered by far right Russian monarchists. Displaying his penchant for reversing things, Nabokov implies a murder attempt AGAINST the monarchy in the story he tells. Picking up Pale Fire, I was immediately reminded of the death of my father by the amusement park sounds mentioned on the first page. The death of my father had an incredibly strong impact on me. The reading of Pale Fire coincided with my body turning the exact age my father was when he died. This brought the memory of his death into sharper focus to the point where I felt it in my body. Like Nabokov, my father and I shared the same first and last names. Nabakov valorizes coincidences in Pale Fire, I am valorizing them here. The value of coincidences is that they can communicate information and instruction to your evolving self. Synchronicities and coincidences can be considered a pale fire for your spiritual growth. In the commentary for Lines 734 - 735 Nabokov has Kinbote say: "A third burst of contrapuntal pyrotechnics. The poet's plan is to display in the very texture of his text the inricacies of the "game" in which he seeks the key to life and death (see lines 808 - 829)." Lines 808 - 829 describes the value of coincidences for John Shade. The next 5 lines refer to Qabalah. Pleasure in it as they who played it found." Qabalah does give a great deal of pleasure for anyone who likes to solve puzzles and make new connections. Characterizing this game of coincidences and correlated patterns as "contrapuntal pyrotechnics" also points to qabalah. One tradition says that the letters of the Hebrew alphabet, the basis for qabalah, are letters of fire; fire partly due to the active, energetic nature qabalah brings to language. Qabalah introduces variability into language. Many more ways, more paths, more neural connections open up for receiving and/or interpreting a communication with the application of qabalah. The information of any given communication increases dramatically when put under this lens. This is Kinbote's commentary introducing the reader to John Shade's murderer - he had various pseudonyms two of them being Jakob Gradus and James de Gray - via an extraordinary coincidence. John Shade's name itself suggests death. From Homer to Virgil to Dante classic literature has a long history of referring to dead people as shades. The "contrapuntal nature of Shade's art" suggests the contrapuntal nature of death's art. Art usually appears as the creation of something. Death's art can refer to bardo training, the art of surviving the death of the meat package, the physical body. Death's art can also refer to the transformation that occurs in a death/rebirth ritual. In magick rituals the everyday ego undergoes a temporary death to be reborn as something different. Via an extraordinary coincidence Nabokov introduces John Shades murderer, or the murderer of Death, if we stay with Shade's etymology, by the lines "And then the gradual." The murder of Death obviously reverses the superficial meaning given, the murder of John Shade. Nabokov constantly reverses many things in Pale Fire. The murder of Death increases life, obviously. The murder of Death (Shade) is gradual in Vlad's story. Again, this correlates with bardo training and magick. Proficiency in each of these arts usually appears gradual. Obviously this line of pondering gets twisted and convoluted. Once again, welcome to Pale Fire. Coincidences have played such a huge role in my spiritual trajectory that I found it interesting that page 77 began with the phrase, "By an extraordinary coincidence..." When I first saw this no extraordinary coincidence appeared on the horizon, it simply reminded me of how much I value and use coincidences. I wasn't expecting any extraordinary coincidences either. Expectations almost always seem invocationally defeating. Synchronicities and coincidences, of course, have to do with Time and timing. A month or two later I passed through the point where my body was exactly the same age as my father was when he died on the operating table from a bad heart. I had some strong bardo moments around that time including one night of feeling that I could die that night. Probably psychosomatic, I'd been ruminating on his death and my age. And/or it could be an empirical psychic connection to the event of his death through the resonance of my age, a resonance across time. Right around this time, I got the notion to look up line 77 in John Shade's poem and it definitely startled me. Such as "bad heart" always to him refer. Given my mindset with the consideration of my father's death, that became an extraordinary coincidence for me. I was on tour when the Pale Fire reading group finished. The day of posting my final comment found me staying in a hotel outside a small amusement park just outside of Washington, D.C. It reminded me of the film, Carnival of Souls.